PSA Group—Europe’s second-largest car manufacturer with brands that include Citroën, DS, Peugeot, Vauxhall and Opel cars—is increasing factory performance and reducing production costs as part of its “Excellent Plant” initiative, utilizing Universal Robots (UR) to help drive the project’s success. 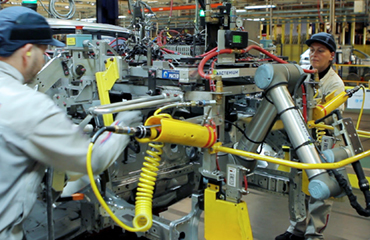 Results of the new robotic assembly system include improved worker ergonomics and cost savings of two to eight Euros per car, which represents up to 400,000 to 1,600,000 Euros in initial cost savings. The automated UR robot system also aids producibility through a 10 percent improvement in geometric dimensioning and tolerance (GD&T) and has an excellent operational yield, with no failures reported in the first year with over 200,000 cars produced. Universal Robots was co-founded in 2005 by the company’s CTO, Esben Østergaard, who wanted to make robot technology accessible to all by developing small, user-friendly, reasonably priced, flexible industrial robots that are safe to work with. Since the first collaborative robot (cobot) was launched in 2008, the company has experienced considerable growth with the user-friendly cobot now sold worldwide. The company, which is a part of Teradyne Inc., is headquartered in Odense, Denmark, and has subsidiaries and regional offices in the United States, Germany, France, Spain, Italy, Czech Republic, Turkey, China, India, Singapore, Japan, South Korea, Taiwan and Mexico. In 2017, Universal Robots had a revenue of USD 170 million. For more information, please visit www.universal-robots.com or read our blog at blog.universal-robots.com.